Sale Towels going fast-Place your order today! Our Zulu Towels have sold out and orders are coming in on other styles. At this great price they won’t last long. We still have inventory in these amazing towels and hand towels, so visit our website and view all the remaining Towels and Hand Towels we are discontinuing. 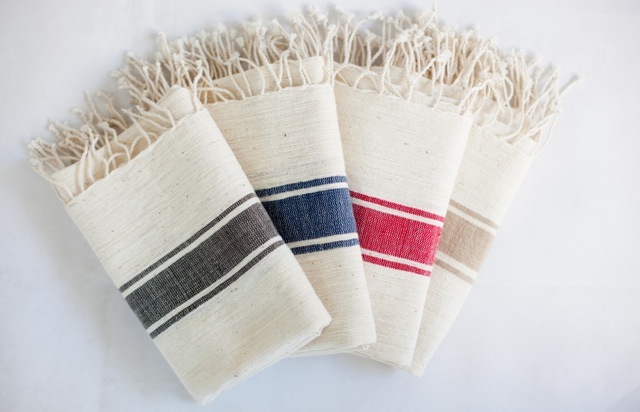 Select from these styles only…French Towels(pictured), Axum towels and hand towels, Baro towels and hand towels, Zarima towels and hand towels, Gondar towels and hand towels. The headings are clearly marked-ON SALE while quantities last. Clicking on the style will show you what colors remain in each style. Email us at info@wovenpromises for pricing.